Despite a large number of well-publicized sweeps and routine cleanups of homeless encampments throughout the city, records on file with the Department of Public Works show that city cleaning crews only picked up and preserved the personal belongings of 23 homeless people over a six-month period. Since February, two major homeless settlements underneath the Division Street and the Cesar Chavez Street freeway underpasses have been ordered dismantled by the city. The sweeps placed some 100 homeless people in shelters, while ushering dozens of others to other areas. Public Works and other agencies remove campers’ property that they are unable to move themselves or take to the shelters. Under the city’s “bag and tag” program, personal property deemed “abandoned” is supposed to be logged and then stored for up to 90 days at a storage yard at 2323 Cesar Chavez St. Despite the widespread sweeps, public records of items taken from homeless encampments and stored by Public Works between January and mid-June produced only 23 files of confiscated items. It is unclear what happened to the items owned by the hundreds of homeless people who have been cleared from encampments during that same period, but Rachel Gordon, the spokesperson for Public Works, said that some 78 abandoned items were reported by Public Works’ radio room, which tracks 311 calls. However, these items seem to not have been filed with the storage yard’s log. City wide, routine cleanups of encampments are conducted by Public Works “around the clock,” said Gordon. “People can come [to the storage facility] five days per week during the daytime hours and get their belongings if they are here,” she said. The problem is that such items are rarely there. Only four of the 23 files logged over six months were complete with forms that detailed the property owner’s full name, a description of the items, the date on which they were seized, and the location from where they were picked up. The other files came in the form of green tags that at best were marked with a name and date, but lacked a description and location of what property was picked up where. Only one of these tags indicated that a homeless woman retrieved her belongings from the yard. “It’s been practice for past few years that so many belongings are thrown out or destroyed, that the homeless have reason to be hopeless,” said Elisa Della Piana, legal director for the Lawyers’ Committee for Civil Rights. In early June, Della Piana’s organization and other civil rights groups called for a moratorium on illegal homeless property seizures and demanded that the city adopt “corrective measures” that comply with the law. 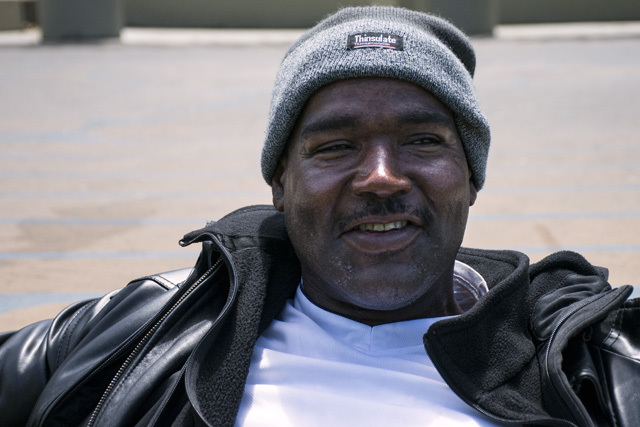 In the year that he’s been homeless, Alexander Richardson has come to terms with the fact that many of the rights he once enjoyed — like sitting on the sidewalk, or sleeping without being rousted — are no longer a given. In recent months, he’s learned the hard way that being homeless also means losing claims to what little property he has. Richardson counts two shopping carts, a keyboard, four bicycles, personal documents, some clothing and a sleeping bag among the items that he lost in two city-ordered sweeps of his encampment. The sweeps happened less than a month apart. “These are things that I need to live out here,” said the 50-year-old San Francisco native. Richardson said he sells collected items at a local flea market for cash. But since Department of Public Works cleaning crews descended on his encampment at 16th and Folsom streets in what he believes was a “push to clear the streets for Carnaval” last month, Richardson has been at a loss. California law dictates that property confiscated from homeless people by cities must be accompanied with an adequate “pre-and-post seizure” process that includes providing homeless residents with ample warning of impending cleanups and an opportunity to reclaim their belongings. Advocates say the city frequently violates its own policy — as well as state law — with routine encampment cleanups during which homeless people’s property is seized and destroyed without regard. The public records request and interviews with homeless people seems to affirm that view. This process leaves the homeless even more vulnerable by depriving them of items that are “critical to their health and well-being,” such as tents used for shelter, according to homeless rights advocates. “What’s happening right now is illegal and it’s not working,” said Della Piana. John Reilly, a Public Works supervisor who manages the storage yard used by Public Works, said that tracking personal property is no easy task, especially when camp residents are not present at the time of a sweep. “Medication is the first thing that we look for because their name is there … you have something solid to go on. We look for anything — legal documents — to try to create a record,” said Reilly, adding that attempts by homeless people to reclaim their belongings at the yard are rare. 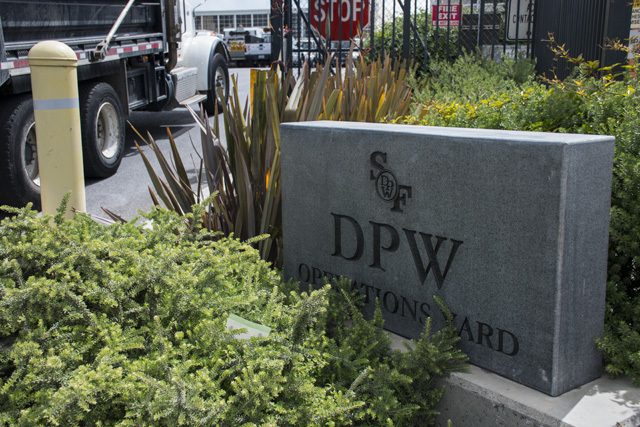 Located in an industrial pocket of the city where the Mission meets the Bayview, the Public Works storage yard is not directly accessible by public transit. Some of the homeless people who have taken on the trek said that they “waited hours to be helped,” only to leave empty-handed. “When I got to the storage facility, the worker there didn’t even ask for my name — he just asked me to describe my stuff,” said a woman named Tammy, who lives in an encampment near 17th and Folsom streets. Richardson, the 50-year-old homeless man, has made two unsuccessful attempts to reclaim his property from the yard. Although his property was indeed tagged and on file at the storage yard, his tag was also marked with the words “damaged,” meaning they had to be thrown out. Because many of his items were “brand new,” Richardson says that the damage occurred at the storage yard. The storage area where the seized items are kept is only partially enclosed by a fence and a makeshift roof that offers little protection from the elements. “If its natural [damage], it’s not on us. We have a place where we store [items] to our best ability and keep it from getting damaged,” said a Public Works manager, who declined to give his name. The manager handed Richardson a piece of paper with the phone contact of a city attorney. “Call this number if you want to make a claim,” he told him. Richardson said he didn’t seriously consider taking this step until he was forced to return to the storage yard a month later, following a second sweep of his encampment that again left him with nothing. The second time, Richardson waited an hour and a half before he was met by the same manager who told him that his confiscated property had been damaged in April. This time, the manager told Richardson there were no records of his property at all. Activists like Della Piana and Cutler are calling for a more “consistent and coordinated” effort by Public Works and other city agencies responsible for camp cleanups in addressing the property of San Francisco’s homeless population. Advocates have set a June 30 deadline for Mayor Ed Lee to respond to their demands under threat of suit. Gordon said that the department is looking into “the concerns that have been raised” regarding Public Works’ “bag and tag” process. “We don’t want to be the bad guys in this situation,” said Gordon. This story was published as part of a citywide initiative of some 70 news organizations to cover homelessness. You can see the full range of coverage here.